Galli Village Café Makati is a cozy and rustic restaurant that has the atmosphere and food that will make you enjoy the ambiance and pleasure of quiet dining just a stone’s throw away from the busy and fast paced Makati district. When you get tired of eating at the usual restaurants in the commercial places of Makati, this Cafe can be such a relaxing getaway experience to make one’s day a little bit different from the usual hectic city life. It is across the Shrine of the Sacred Heart Church and thus is frequented by many church goers who have become somewhat a part of the café’s family of friends. The concept of Galli Village Café is inspired by images of small village cafes found scattered in many European, Asian and American countries. Photos of these are pasted on the walls of the Café. These are favorite destinations of the local people as well as travelers who mingle with each other to make these cafes places of interest. 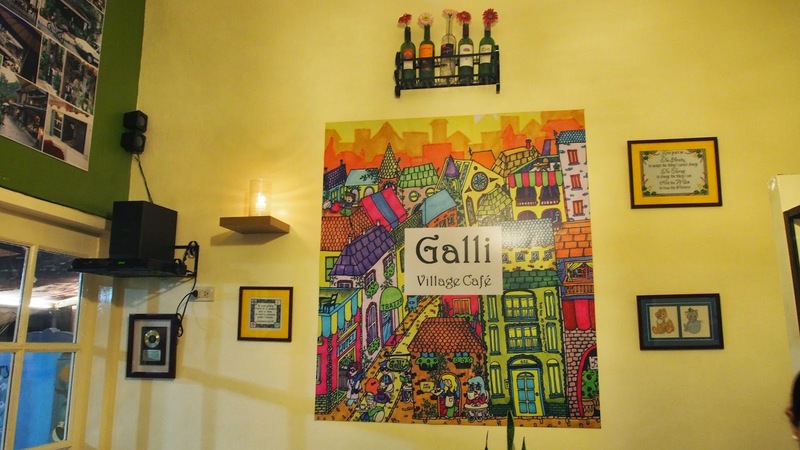 Galli Village Café maintains its basic character as a place that offers unpretentious but tasteful food in a cozy and rustic atmosphere. Located in the YMCA of Makati Building in Sacred Heart Street, San Antonio Village, Makati City, just 3 minutes away from Ayala Avenue. Galli serves very good food that are really inexpensive. The specialty of the house is Paella Valenciana, guaranteed to satisfy the customer because it is very delicious as it is always freshly cooked. At a price of P255 per order (good for 2-3 persons), it has been a huge favorite; not only for dine-in, but for take-outs as well. Other popular dishes at likewise reasonable prices, from P160-P195, are beef salpicao, shrimp gambas, angus beef tapa, fish tofu in taosi sauce, lengua con seta, beef adobado, pasta puttanesca and spaghettibolognese. Most are regular dishes found in other menus, but at Galli Café, the inspiration has been to cook them above the ordinary at prices that won’t hurt the pocket. Galli Village Café is simple but it has character. It is unlike the usual restos in the Makati district because its surrounding areas are not business-like. With its plant covered al-fresco fronting its dining area, eating in this café definitely becomes more refreshing. Customers do linger after eating because the place is very relaxing. When you go inside the café, you will immediately feel at ease with the neutral colored walls, wooden chairs, and the decors. It is also filled with books on travel and people. Need some time alone to work? Bring your laptop and enjoy the ambiance that calms you – despite the deadline you have to meet. The place is also perfect for small meetings that require a rather quiet atmosphere. For small parties or get-together occasions, this café can accommodate up to 20 people in the dining area and another 20 in the al-fresco. For dates, it is perhaps a near perfect setting especially at night in the al-fresco. Parking won’t ever be a problem. The YMCA Hotel have adequate parking spaces in front, and street parking is not congested at all. 7 Sacred Heart St., San Antonio Village, Makati City. Contact No: 0932 971 7250 for reservations or advance orders.